Our inner nerd was already completely thrilled at the release of DisplayLink driver source code for Linux, but he's positively frothing at this elegant implementation. 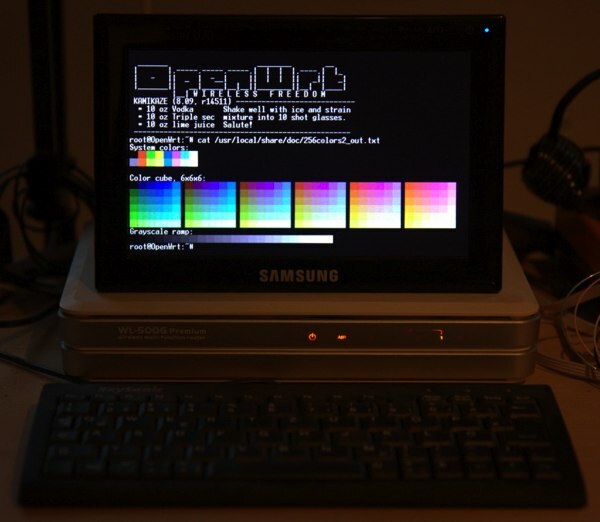 It's simply a Linux-based, OpenWRT router (the ASUS WL-500g Premium, to be specific) with a Samsung U70 USB display and a keyboard plugged in, but the DisplayLink driver turns what would be otherwise a headless, networking-only server into a totally elegant PC. Sure, that 300MHz embedded processor won't be powering past your Atom-powered machines or pretty much any other "modern" hardware, but it's basically a tinker's dream -- suddenly almost anything with a USB port and a processor somewhere within it could become a computer with the right amount of know-how. DisplayLink for Linux turns a humble wireless router into a beautiful PC originally appeared on Engadget on Mon, 18 May 2009 17:12:00 EST. Please see our terms for use of feeds.